Today is, appropriately, All Saints’ Day, when my faith celebrates all the people—saints—of God who walked the way of faith with courage, devotion and love. Now our mom would never have called herself a saint, but if we believe that saints are flawed human beings who do their best to offer God’s grace and love in the world, then our mother is a saint. First Peter 4: 8 says, “Above all, love each other deeply, because love covers a multitude of sins.” And by that measure, our mother is most definitely a saint. It’s hard to imagine a world without our mom. As long as she has been in the world, we have known that we have someone who loved us unconditionally, cheered us on in whatever we decided to do, and defended us with her last breath. Mom gave this same unconditional love to anyone who was blessed to call her friend or family. In her last years on this earth, she loved nothing so much as being visited by close friends, nephews and nieces, grandchildren and great-grandchildren, and daughters and sons, and even our dog Beckley. When we visited, she would proudly tell the nursing home staff, “This is my daughter!” or “This is my son!” just in case they had forgotten. 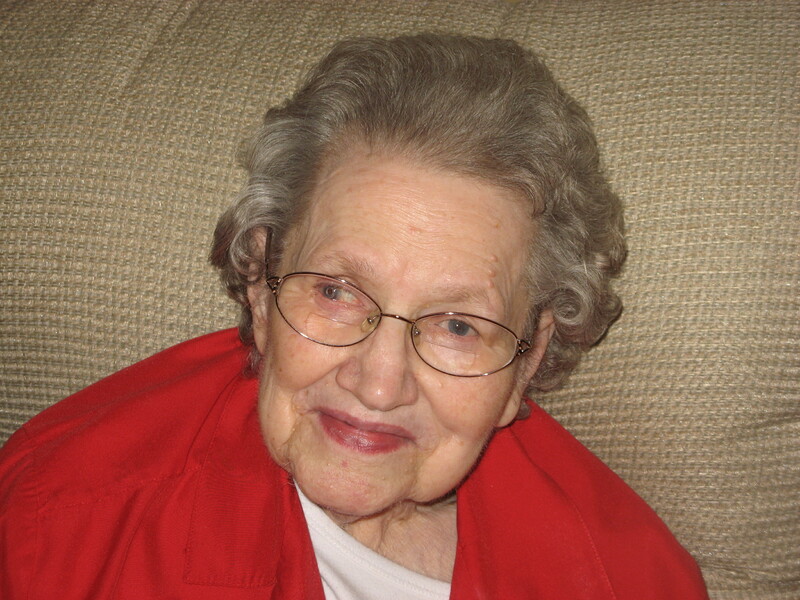 She would sit in her bed or her chair, smile at us, listen to our stories, and sometimes tell us stories that we had heard a hundred times—but always, we knew that as long as she walked this earth, whether we made her proud or disappointed her, that we were loved with a love that was pure and fierce and complete. Our mom is our hero. She taught us by her example that no matter what life may require of us, it is possible to be strong, to endure, to triumph. Mom did not have an easy life. Her father died when she was three years old. Her mother, whom she adored, died before any of my brothers were born. In October 2011, when Mom had no choice but to have surgery and when the doctors prepared us that she might not make it, she woke up, asked what day it was, and when we told her October 25, she said, “I have no intention of dying on the day Mommy died. Estelene, you don’t remember Mom. I want my great-grandchildren to remember me.” And so, with a will that not even her doctors understood or believed in, Mom lived. And when Mom decided to be stubborn, we knew better than to doubt her. Mom learned to work hard and take care of others from an early age. Though she loved school, she had to quit when she was in ninth grade to help out at home. She never quite got over this, and she even named me for one of her favorite teachers—Eskaline Perdue, the one who was most disappointed when Mom decided to drop out. The one thing that Mom and Dad most agreed on in regard to being parents was that, no matter what, they would see to it that their children got an education. With our dad, she stressed to all of us that an education was the key to having a better life than they had. Once she had seen to it that all her children had a high school education, she enrolled in classes and earned her GED, an accomplishment of which she, and all of us, were proud. Her review class instructor told her that he could see where her children got their intelligence and their determination. And once she had seen us safely into adulthood, she focused on learning how to drive a car. And though all of us were more than a little skeptical about her abilities behind the wheel, most of us had accidents while she tooled around in her Vega and kept our dad and herself safe on the roads–even driving once to Pipestem for a family Christmas in a snow storm and once back from Richmond in a near blizzard. When she finally had an accident in Richmond when she was in her late 60s, she continued to drive, but a little more nervously. Finally, she relinquished her car. But she renewed her license online until she had to admit that she could no longer pass the vision test and that her vision made it unsafe for her to be on the road. And renewing her license wasn’t the only thing Mom did online. Even when she couldn’t live on her own any more, she insisted that Marcella help her set up an email account and give her her own access to the Internet. And at the age of 75, she wanted to have an account on Facebook and delighted in posting on the pages of her loved ones. When one of her grandchildren posted a picture that might have made Mom worry, another of her grandchildren sent a message that said, “Hey, you know Grandma reads your Facebook page, right?” And when we took a laptop to her bedside, she loved looking through everyone’s pictures, and she dictated to us what she would like to post on the pages of the people she knew. Mom has always been good with her hands. She could put her hand on our heads and tell whether we had a temperature. If we did, she allowed us to stay home from school, and she gave us soup, sat by the bed, and rubbed her hand soothingly over our hair. If we didn’t, she gave us a swat to the backside and sent us out the door, telling us that if we weren’t feverish and throwing up, we needed to be in school. While we were at school, she cleaned house, canned tomatoes and other vegetables, and made pinto beans or soup, finding ways to stretch a coal miner’s budget that saw to it that we were never hungry. We came home to hear her singing “I Come to the Garden Alone” or “Amazing Grace” as she cooked dinner. We used to say that she could probably make a fortune if she wrote a cookbook entitled 1001 Ways to Make Chicken and Hamburger. But she did take a break each day to watch Days of Our Lives with her latest crochet project in hand. We all have afghans, bedspreads, table scarves, placemats, furry winter scarves, baby blankets, and even snowflakes and angels for our Christmas trees that Mom made lovingly for each of us. They are the envy of our friends who knit and crochet, and they decorated every home Mom ever lived in. But let anyone outside the family hurt one of us, and you had better get out of the way because our mom could have taught a grizzly bear a thing or two or a hundred about how to be a Momma Bear. The only time during our entire childhood that we ever heard our mom curse, she did it in defense of her children. I had gotten glasses for the first time, and the doctor had had to convince me that I would be able to see things I had never seen before. But when I got home, the boys next door, the neighborhood bullies, teased me unmercifully and made me cry. When Marcella came to my defense and couldn’t stop the boys, Mom spoke with their mother, who did nothing to stop them. They made all our lives miserable for days…until our mother decided it was enough and used words we had never heard from her mouth. By today’s standards, when you can hear far worse language by walking through a school hallway, Mom’s only attempt at using profanity is hilarious. Even then, it couldn’t hold a candle to the language Dad and his friends used on a routine basis. But what she lacked in colorful language she made up for in righteous anger, and no one in the neighborhood who heard her yelling doubted her determination to protect her children from bullies. The mother next door was so shocked at the change in our meek mother that she went to the magistrate and filed profanity charges against Mom. (Yes, young people, you could do that in those days!) After the excitement was over, this became the one transgression that we could tease our mom about. And so, we all graduated from high school, and four of us have gone to college. Our lives have taken very different paths from our mom and dad. But they have taught us to be strong in the face of adversity. Together, Mom and Dad saw each other through hard jobs and lost jobs, through children who made them proud and children who let them down, and, finally, they watched with joy the six grandchildren they could spoil in a way they couldn’t afford to do for their own children. They were the apples of their grandparents’ eyes, and unlike Mom and Dad’s sometimes flawed children, they saw their grandchildren as perfect. Mom also got the chance to spoil her great-granddaughters, who always wanted to visit “Mammaw,” sit in her lap and get a Tootsie Roll Pop from the bag hidden in the side of her recliner. We are glad that our children have had their grandparents for long enough to know them. But because Mom and Dad insisted that we strive for a better life financially, we know that our children can never fully appreciate the strength and persistence of their grandparents. Both Dad and now Mom have shown us how to face life to the end with strength and dignity. During the years that Dad was sick, Mom refused, even when she battled breast cancer and lost the vision in one eye, to relinquish Dad to a nursing home where others would care for him. Since Mom and Dad had insisted that their children all get an education and jobs, we did not have the luxury of sparing our mother from a nursing home in her last years. But Mom worked hard to be independent for as long as she possibly could, and in her last years she taught us no small lesson about what it means to be strong when life isn’t what you had hoped for. In the fall of 2009, she had a stroke, and a parade of doctors came to her bedside to tell us that if she survived, she would be a vegetable. But she shocked them all by waking up, talking, and after some therapy, walking and even crocheting again. Then, in the fall of 2010, she had pneumonia and a fall that weakened her so much that we could not give her the care she needed. Luckily, we found a facility five minutes from Marcella’s house—and Marcella has been the most devoted daughter a parent could hope to have, making sure Mom knew that she was loved as she first loved us. If we had a dollar for every time that one of Mom’s caregivers or one of our relatives or friends had told us how sweet she is, we could fund our children’s college educations. She was sometimes stubborn, sometimes preachy, but always strong, and always, always her children’s best friend. And so, Mom, we give you over to Dad and to Gary, and we hope that you are laughing out loud and hugging them and Leslie and Bud and Vada and Harvey J., and Goldie, and, most of all, your own sweet mother, Lizzie Bell. And we hope that you are dancing in God’s light, with Fluffy at your feet, because picturing you reuniting with all the family you have mourned over the years is the only way we can bear to imagine a world without you, our mother who is now in heaven. We adore you, Mom, and we will miss you more than words can express. Previous PostSuffering from Vacation Deficit Disorder?Next PostDoes My Vote Matter? Oh Estelene, I could feel your mother in these words without ever having known her. Thank you for that gift.